Maligne Lake Chalet, on a slight rise at the north end of the lake, opened in 1927 as the heart of Fred Brewster’s Rocky Mountain Camp. Although it was completed long before there was road access to the outside world, it was one of the few places—aside from the Jasper Park Lodge and a few hotels in downtown Jasper—offering tourist accommodations in the park. Fitting perfectly with the government’s aesthetic vision for architecture within the park, the structure was a single-storey building of horizontal logs with a gabled roof. Overnight guests were accommodated in adjacent tent cabins, and the chalet contained a dining room, kitchen, and communal living space. In 1935, Brewster expanded his Maligne Lake operation by adding an additional four-bedroom guesthouse. According to historical records from 1935, he also applied for a permit to build a covered veranda on the chalet and a separate building to house bathroom facilities. Maligne Lake Chalet remained in use until 1976, when the adjacent Maligne Tours day lodge was completed. 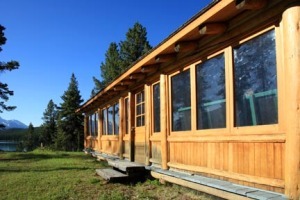 Over the next decade, it was used sporadically as a recreation room for Maligne Tours staff. As a government-owned building of historic importance, it was added to the Register of the Government of Canada Heritage Buildings in 1988. Today, after extensive restoration undertaken by Maligne Tours, the beautiful log building stands as a tribute to Fred Brewster and his considerable contributions to early tourism at the lake. Between mid-June and mid-September, its doors are opened each afternoon 1:30 am to 4 pm for afternoon tea, which includes traditional sandwiches, raisin scones, strawberries and cream, chocolate chip shortbread, fruit tarts, and a selection of loose-leaf teas. The cost is $34 per person. Reservations are essential. Make them by calling (780) 852-3370 or visiting Maligne Tours ticket offices located in downtown Jasper at 616 Patricia Street or beside the chalet out at the lake itself.